A nuanced picture emerges from breaking down the different components of human capital—capacity, deployment, development and know-how—as measured by the Global Human Capital Index (Figure 6). First, the Index exhibits the greatest variety across its Capacity subindex, measuring the human capital built through past education investments. Going beyond national population averages, our data highlights the generation gap in terms of unequal distribution of this component across the age-group spectrum. The countries and regions performing best on this dimension—not just the Nordic countries but also a number of countries in Eastern Europe—tend to have long-established national education systems that have been successful at equipping older generations with a formal education in decades past. By contrast, older generations in emerging regions such as Sub-Saharan Africa and South Asia tend to have little formal education attainment. However, the Index does capture the recent successes of the younger generations in these countries. Across the Capacity subindex, there are 15 countries that have developed more than 80% of their human capital and a further 48 countries that have realized between 70% and 80%. In addition, 28 countries score between 60% and 70% and 13 between 50% and 60%. However, 26 nations are yet to realize even 50% of the formal educational potential of their population or more. For a deeper analysis of this dimension, please refer to the Capacity section below. Second, compared to the Capacity subindex, the Human Capital Index finds a somewhat narrower range of outcomes across its Deployment subindex, which measures the extent to which countries are developing human capital through deployment in the labour market. Nine countries have developed more than 80% of their human capital through this component, while 29 countries rate between 70% and 80% and 56 countries between 60% and 70%. The remaining 36 nations have developed less than 60% of their human capital on this subindex. The countries and regions scoring highest—in particular in East Asia and the Pacific as well as Sub-Saharan Africa—tend to have very high labour force participation rates among both men and women and low formal unemployment rates. 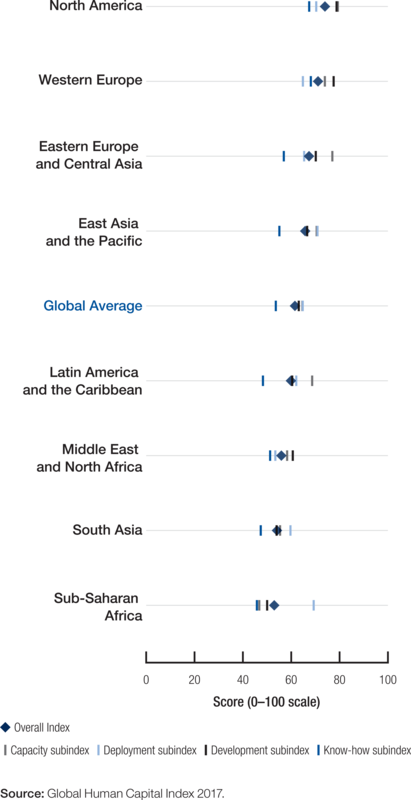 By contrast, countries and regions performing less well—including in South Asia, the Middle East and North Africa but also Latin America and the Caribbean and Western Europe—generally have untapped talent pools with regard to fully leveraging their people’s human capital potential in the labour market, whether due to workforce gender gaps, high unemployment rates among certain age cohorts, or both. Our age-disaggregated data, once again, highlights distinct patterns across the age-group spectrum. In many countries, indicators such as labour force participation follow the expected rhythm of the human life-course. However, benchmarking countries against relevant peers also reveals relative under- or over-performance, for example with regard to high youth unemployment or low workforce participation among older workers. For a deeper analysis of this dimension, please refer to the Deployment section below. Third, the Index’s Development subindex measures countries’ current success in building the human capital of their next-generation workforce as well as in continual upgrading the human capital of those people already in the workforce through lifelong learning. It reveals that, currently, a wide gap remains between different countries’ efforts to maximize their people’s future human capital. The countries and regions performing best on this dimension—including the Nordic countries and Switzerland but also the United Arab Emirates—successfully combine efforts to build a broad and diverse future talent pool with attention to quality and inclusivity. Those that are underperforming—including a number of countries in Latin America and the Caribbean—tend to neglect investment in their people’s future human capital relative to their past achievement in previous generations. Across this subindex, 10 countries score more than 80%, while 32 countries score between 70% and 80%. A further 40 countries score in the 60% to 70% range. However, 25 countries rate between 50% to 60% and 23 countries score less than 50%. For a deeper analysis of this dimension, please refer to the Development section below. The final subindex, Know-how, captures the current quality and skill-intensity of employment in a country and the extent to which its workplace environment is likely to create additional learning opportunities. All countries will need to undertake additional efforts to fully realize their people’s ability to shape and thrive in the emerging economic environment of the Fourth Industrial Revolution. In the countries that are currently the most successful in leveraging their people’s know-how—such as Switzerland and Singapore—a majority of the population work in high-skilled and expertise-based occupations within a complex, diversified economy. By contrast, a large number of countries in regions such as Sub-Saharan Africa, South Asia and Latin America and the Caribbean have yet to create work opportunities for their people beyond routine and lower-skilled occupations or beyond a limited number of sectors. Across the Know-how subindex, there are currently only 10 countries that score over 70%. In addition, 24 countries score between 60% and 70% and a further 47 countries score in the 50% to 60% range. Forty-nine countries in the Index have yet to cross the 50% threshold. For a deeper analysis of this dimension, please refer to the Know-how section below. For further implications and analysis of the four subindexes please see the Thematic Analysis section below.